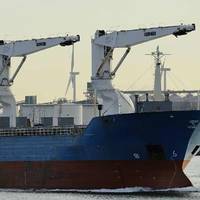 The Swedish shipping company owned by Aspo's ESL Shipping, AtoB@C Shipping has acquired a 4,100 dwt dry bulk carrier of ice class 1A built in 2000. Previously, AtoB@C operated the vessel under a long-term time charter.The shipping company also owns the sister vessel of the newly acquired dry bulk carrier.This transaction improves the availability of vessel capacity ideal for customer contracts. It is expected to have a slight positive impact on profitability, but no significant impact on the balance sheet. Portugal’s Naval Rocha shipyard is reporting a surge in activity in the opening half of 2018 after delivering a series of drydock, wet basin and pier-side projects.Naval Rocha commercial director Sergio Rodrigues said the yard located in the heart of Lisbon Harbour on the north bank of the River Tagus has completed a wide variety of repair and conversion projects.Key work has involved containers, cruise, passenger and sailing ships, cargo and research survey vessels, naval ships, anchor handing tugs, supply vessels and dredgers.“Naval Rocha is a unique, modern shipyard,” said Mr Rodrigues. Maritime Holdings Delaware, LLC, parent company of project, breakbulk and heavylift cargo carrier Intermarine, LLC has entered into a joint venture agreement with Zeaborn Group.The joint venture entity, ZeaMarine GmbH, will include the transfer of assets and operating entities from Zeaborn´s commercial activities as well as Zeaborn-owned Rickmers Line GmbH and Maritime Holdings-owned Intermarine, LLC.The shareholders of the newly-formed ZEAMARINE will also commit to fund new capital to grow the joint venture. Zeaborn Group will serve as the majority shareholder. Compared to new technologies, conventional engineering in shipping is a relatively simple science: computable and generally predictable. However, heavy lift shipping presents challenges that go far beyond what is required with standard unitized cargoes. 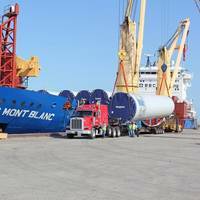 The transportation of project cargoes - often highly valuable components of multi-billion-dollar projects - requires expert planning to ensure they are loaded and transported safely and efficiently. 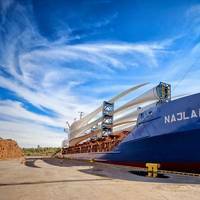 Last year AAL shipped two giant cyclone vessels (22m x 11m x 10m and weighing over 500mt each) to Petronas’ $27 billion RAPID project in Malaysia. 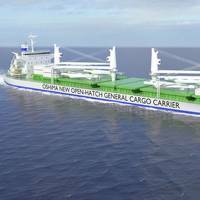 A new 65k open-hatch general cargo carrier design concept jointly developed by DNV GL and Oshima Shipbuilding has been launched at Nor-Shipping. 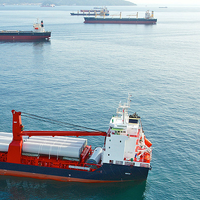 Intended for a wide range of project cargoes and packaged goods, the vessel design includes composite tween decks to maximize space utilization and save weight. This tween deck solution was also awarded an Approval in Principle (AiP) by DNV GL, presented to Sho Minami, the CEO of Oshima Shipbuilding Co., Ltd, by Knut Ørbeck-Nilssen, CEO DNV GL – Maritime. 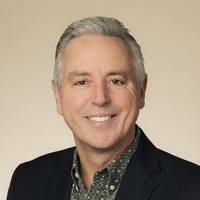 Matson, Inc. president and chief executive officer Matthew J. Cox will succeed retiring chairman of the board Walter A. Dods, the company announced today. The appointment becomes effective at the end of the company's annual shareholders’ meeting today, as Dods retires in accordance with the company's corporate governance guidelines limiting board members’ age. “In my nearly 30 years associated with Matson, I've never felt stronger about its leadership and long-term prospects,” Dods said. South Korea’s Hanjin Shipping is planning on submitting a self-rescue plan to creditors this week to stave off bankruptcy by Aug. 25, reports Korea Herald quoting local media. 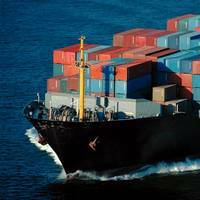 According to the shipper, the plan includes details on securing funds from its parent Hanjin Group and cutting charter fees from foreign vessel owners. According to Pulse, Hanjin Group is expected have stronger units like Korean Air help out their troubled affiliate Hanjin Shipping through new share purchase and negotiate for cut in charter fees to up to 28 percent to normalize the country’s largest cargo carrier. 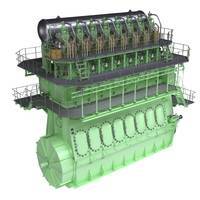 Rolls-Royce has signed a $6.5 million contract with Tersan Shipyard in Turkey to supply a liquefied natural gas (LNG) propulsion package for a cargo carrier designed by NSK Ship Design for Norwegian ship owner NSK Shipping. 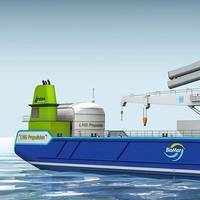 The vessel will deliver fish food on behalf of BioMar Group. The new cargo carrier will be a slightly larger sister ship to NSK Shipping’s MS Høydal which was the world’s first LNG powered cargo vessel and which was delivered from Tersan Shipyard in 2012. Both ships are designed by NSK Ship Design. After successful sea trials, Dutch shipbuilder Ferus Smit delivered a 10,550 dwt multi-purpose cargo carrier M.V. Nordana Sea to Symphony Shipping on February 11th 2016. 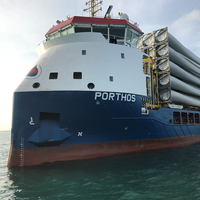 Being the third unit in a series of 6 newbuilds Ferus Smit’s DP2 Ecobox design, departed on her maiden voyage in ballast to Esbjerg, where she will pick up large windmill components to be delivered in Greece. The Ecobox design is characterized by its flexibility of loading combined with very economical and ecological performance. * Main dimensions (Loa X B X T) 122.5 X 17.0 X 7.8 mtr. * 10550 DWT, 429.000 cft hold volume. A kamsarmax bulk carrier owned by Greece’s Transmed Shipping was hit by an explosion in one of its cargo holds while anchored at Paranagua Port in Brazil. The Paranaguá Port Authority says it received a report at about 3 p.m. The explosion may have been caused by gas generated by the maize kept being under high temperature, combined with recent fumigation gas, or by malpractice of the crew. The 235 meters long vessel remained under observation for 24 hours and was surveyed by technicians regarding the sea worthiness. A federal grand jury in Greenville, North Carolina, has returned a nine-count indictment charging two engineering officers employed by Oceanfleet Shipping Limited with crimes relating to the illegal discharge of oily wastes directly into the sea, announced Assistant Attorney General John C. Cruden for the Department of Justice’s Environment and Natural Resources Division and U.S. Attorney Thomas G. Walker for the Eastern District of North Carolina. 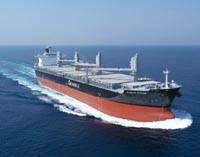 Oceanfleet Shipping Limited is a Greek shipping company that operates the cargo carrier M/V Ocean Hope. The two engineering officers indicted are the vessel’s Chief Engineer, Rustico Yabut Ignacio; and Second Engineer, Cassius Flores Samson, bolth of the Philippines. 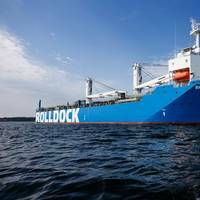 Flensburger Schiffbau-Gesellschaft (FSG) says it has delivered a second multi-purpose cargo ship, named 'Rolldock Storm' to Dutch shipping firm RollDock BV. 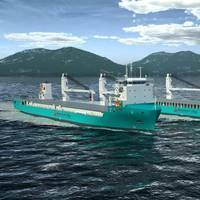 The two versatile new ships, Rolldock Star and Rolldock Storm are 151.5 metre-long, multi-functional, specialised ships designed to transport challenging, heavy loads which do not fit traditional cargo transport moulds. FSV explains that the vessels stand out particularly because of their maximum flexibility and offer a range of different loading and unloading possibilities. 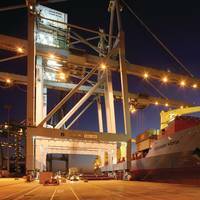 Two heavy- duty cranes move cargo weighing up to 700 tons. 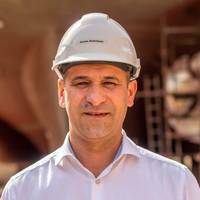 Transas Group and Armada Shipyard (Turkey) have signed a contract for installation of navigation and communication equipment on the two tankers built for the Palmali Shipping, a major oil cargo carrier. The tankers are built in accordance with new series of Armada project RST22M, DWT 7150. Within the contract Armada Shipyard will install a set of radio and navigation equipment including Integrated Bridge System, radio communication console, Intercom and alarm system, DGLONASS and DGPS receivers and other systems. Installations will take place in October 2014 and January 2015 respectively. 2013 Ocean Imports Were 3.7% Higher Than 2012. Zepol Corporation (www.zepol.com) reports that U.S. vessel imports were up 3.7% from 2012, which totaled over 18.2 million TEUs (twenty-foot container) brought into the United States last year. U.S. imports in 2013 started off at a slow start but ended with a surprising and unexpected surge from July through December. Annual TEUs haven't been this high since 2007, which is a good sign for a strong recession rebound in the U.S. trade industry. Mitsui Engineering & Shipbuilding Co., Ltd. (MES) completed and delivered a 72,800 dwt type Open Hatch Jib Crane General Cargo Carrier Siskin Arrow (MES Hull No. 1839) at its Chiba Works to Misuga S.A., Panama, on January 21, 2014. 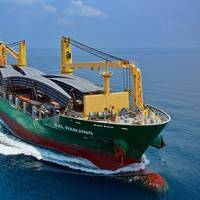 This is the fourth vessel of its series which has a large cargo hold capacity of more than 86,600 m3 with 8 box-shaped cargo holds. Expanded design family of extremely versatile heavy goods transporters. HeavyLift@Sea presents the MPV 500 Heavy Lifter for intermediate market segment. With the development and creation of the MPV 500, the maritime engineering specialist HeavyLift@Sea, with headquarters in Hamburg's HafenCity, has now expanded its design family of extremely versatile heavy lifters. The multi-purpose vessel is based on the HLV 1600 heavy lifter, which was introduced by the team working with company founder, Lars Rolner, and Managing Director, Hendrik Gröne, at the start of this year.